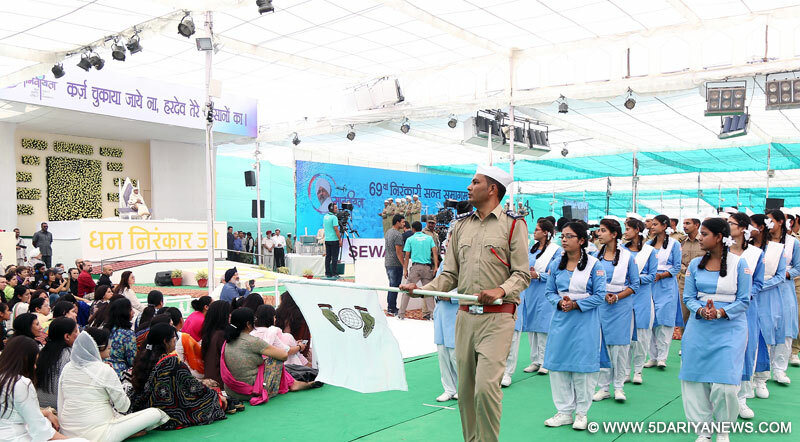 The second day of the ongoing 69th Annual Nirankari Sant Samagam experienced selfless rendition of devotees in uniform during Sewadal Rally today. Displaying ‘World Without Walls’ in its true essence, the members of the Sewadal presented a co-ordinated display of acts and formations with physical exercises, games and aerobics.Reviving the glorious history of the Mission, the Sewadal members showcased the founding of the Sewadal long back in 1956 and its manifold evolution over the years. Her Holiness Satguru Mata Savinder Hardev Ji Maharaj blessed the Sewadal members and recalled how Baba Hardev Singh Ji Maharaj felt a deep sense of pride adorning the Sewadal Uniform. She inspired the members by reiterating the famous dictum, “We make a living by what we get, but we make a life by what we give,” and added that they should maintain the dignity of the uniform and respect every devotee without any discretion. The Sewadal Rally also brought into light the contribution of another important wing of the Mission – Sant Nirankari Charitable Foundation (SNCF). With the strong motive of ‘Serving with Humility’, the SNCF members have been contributing day and night to the society as a whole through Cleanliness and Tree Plantation Drives. Furthermore, the event beautifully portrayed how Baba Hardev Singh Ji’s vision of creating blood relations through blood donations have taken shape in the form of blood donation camps across the globe, resulting in more than 8 lakh units donated so far. Speaking on the occasion, Shri VD Nagpal ji, Member Incharge Sewadal said that these volunteers in uniform have been offering their selfless service not only during Congregations and Samagams but elsewhere also. They have also earned name for the Mission by acting with discipline and dedication during countrywide cleanliness and tree plantation drives and also natural calamities. He sought the benign blessings from Her Holiness so that these men and women in uniform continue to serve humanity in future also. Earlier, on the opening day of the Samagam, Satguru Mata Ji recalled the teachings of her predecessors and how Baba Hardev Singh Ji, over the span of 36 years, strengthened and beautified the Mission’s ideology by nurturing it with selfless love. Her Holiness said that it is imperative that we adhere to Baba Ji’s teachings and lead our lives in the manner he so desired.Remembering Baba Hardev Singh Ji’s aura, Shri JRD ‘Satyarthi’ Ji, President Sant Nirankari Mandal said that his memories cannot be forgotten, and we are fortunate under the guiding light of our present Satguru - Mata Savinder Hardev Ji Maharaj. Seeking blessings of the Satguru, on behalf of the devotees, ‘Satyarthi’ Ji beseeched for wisdom to follow Her Holiness’ teachings in our everyday lives.